When it comes to exercise, burning fat and calories are often used interchangeably, but they’re different. When you exercise, your body burns the calories you consume from food and the fat stored in your body to sustain energy during the workout and recovery. How much fat or calories you burn depends on the amount of food you have eaten and the duration of the exercise. For instance, if you exercise in a fasted state, your body would use your fat storage as fuel. Eventually, you burn through muscle sustain your energy level if you workout intensely on an empty stomach. Exercising on an empty stomach can help you burn 20 percent more fat, according to a study published in a 2013 issue of the “British Journal of Nutrition.” However, the researcher note that these are short-term findings in a limited study of ten males. More extensive research produced conflicting results. Fitness author, Brad Schonfield, published in a 2011 issue of the "Strength and Conditioning Journal" found that exercising in a fasted state makes it difficult to train – even at a moderate level, which will lead to less calories burnt than exercising after a meal. Schonfield also warns that exercising on an empty stomach can lead to a loss of muscular strength. Columbia Health states that exercising in a fasted state will not boost weight loss and may lead to eating more calories later in the day. The best time to exercise depends on your personal circumstances. If you are more willing to exercise in the morning, you are more likely to burn more calories. 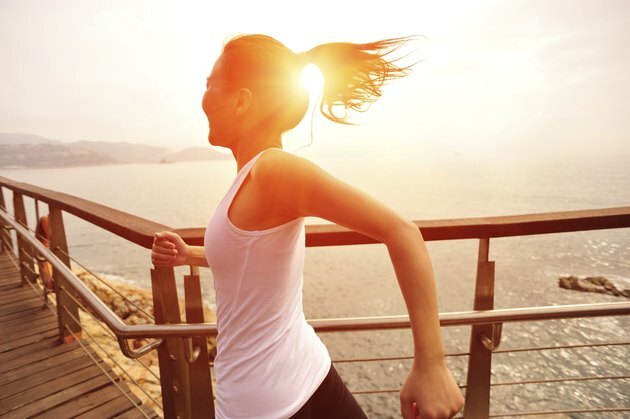 Factors such as cooler weather in the morning than later in the day, or having more energy in the morning can increase your likelihood of exercising more vigorously. And research have shown that vigorous exercise, such as high-intensity interval training leads to more calories burned during and after a workout. Whether you exercise in the morning or not, preparing your body for exercise can help you burn more calories. Give your body time to digest and absorb the food you have eaten. If you are working out in the morning right after you wake up, choose a light breakfast of about 300 calories, such as a whole meal bagel with peanut butter spread, or a fruit smoothie, an hour before you exercise. You can have a larger meals of 500 calories or more, if you are exercising three to four hours later, according to Columbia Health. Eating sugary food causes a quick increase in your blood sugar, but it will also lead to a quick drop, which may cause lightheadedness during your workout. Columbia Health: Morning Workout Increases Metabolism Throughout The Day? Columbia Health: Best Time Of Day To Exercise?